Luckily he was, and more than that we started to work together on the idea of using some of the code from the original in order that this not just be a remake but as close to the original as possible. Over six months later, and numerous redesigns of my code as I repeatedly ran out of memory, and the game is finished. I'm really pleased with the result, not just from a coding stance but also in my appreciation of the original game, how it was coded, and just what an amazing game it still is. 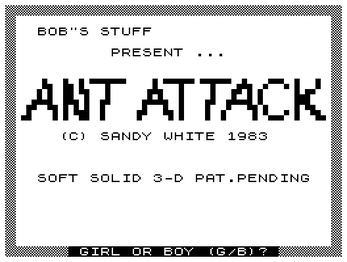 For more information on the original game, visit the Ant Attack page on Sandy White's website. Sandy White - "Awesome! You've really pulled off a Miracle! I'm grinning ear to ear!" Philip Oliver - "Taking it to the ZX81 - you're going the wrong way!"